When I searched over the web I noticed that there were hardly any Gtalk Themes. So, I decided to make some. 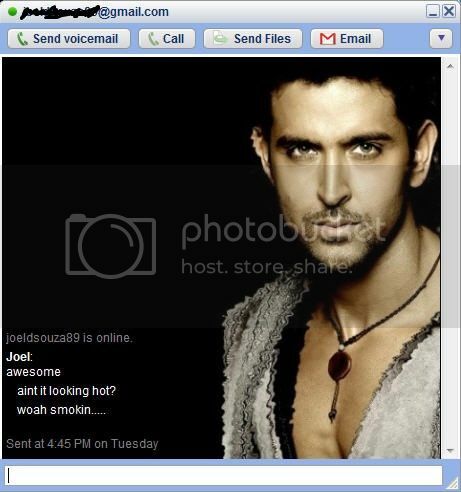 Previously I had made some celebrity Orkut themes which most of you liked, so I thought of sharing with you’ll some GTalk celebrity themes that I made today. These themes not only have great backgrounds of celebrities but also have emoticons integrated in them. Firstly, download the theme you like. Extract its contents to ‘C:\Users\Your username here\AppData\Local\Google\Google Talk\themes\user\chat’ folder. Once done start GTalk and go to Settings> Appearance> and choose the theme you downloaded.